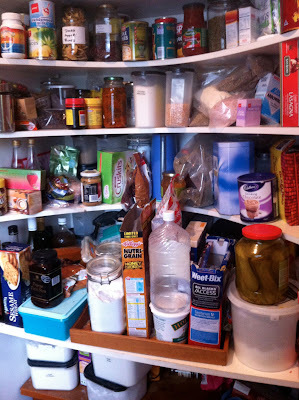 Lately I've been feeling overwhelmed by the amount of food and mess in my pantry and freezer. I've gone looking for things I know should be in there, but not been able to find them. So I decided it was time to have a good clean out, re-organise and stocktake. I started with the pantry on Thursday, when L was at Kindy and S was meant to be napping. Unfortunately Sophie didn't nap, so I got interrupted dozens of times and sorting out the pantry literally took hours. 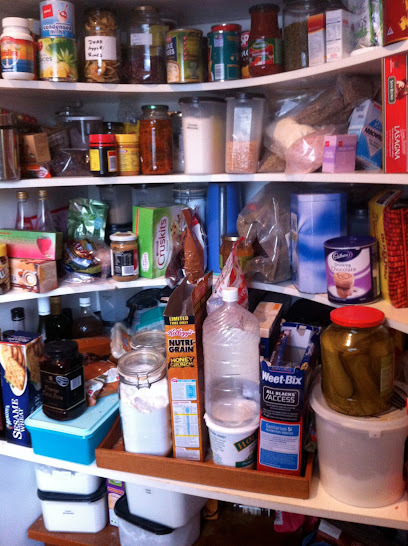 To organise the pantry I took everything out, wrote it all down, consolidated like items, chucked out anything too old to use, wiped out the shelves and put everything back in what I think is a more logical place. Today I did the same thing with our freezers, although I forgot to take any before photos. Our small freezer is dedicated to lunchbox fillers and snacks for the girls. 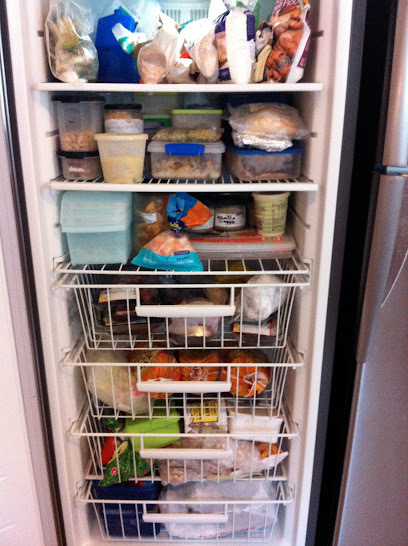 Our large freezer is dedicated to dinner ingredients, leftover meals and baking ingredients like wholemeal flours and nuts that I don't want to go rancid in the pantry. Next on my to do list is the fridge. In the meantime, I've recorded my food stocktake by category into a spreadsheet on Google Drive. This way I can access it from my iPhone or computer and use the information for weekly menu planning. How do you keep track of food in your house? Go the Tupperware for organising!!! I use a spreadsheet too! For pantry, freezer and non-veg stuff in the fridge (things in jars, sauces etc). Glad I'm not the only one! I've been doing it for about 5 months and it's dropped our food bills by about 25%. It makes "seeing" what's in there, and menu planning, so much easier. I also highlight things I want to use up, which makes for a good reminder - oh yeah, that chilli bean paste has been in there for ages, must have a stirfry next week. I'm loving the spreadsheet too. I don't know why I didn't think of it sooner. Now I can sit down to menu plan at my computer and not have to get up and check what ingredients we have in the kitchen. This is feeling so good! Its a good feeling. Do you find you've bought heaps of one thing? We had something like 8 cans of coconut milk one time, I must have just kept buying it each week! We just have heaps of cereal. I don't buy it but Paul likes it for breakfast and I think he must buy a new packet or two every time he goes to the supermarket, without checking what we have at home first. I hope it's going to help that I've put all the cereal at the front of the pantry so he can see we do actually have some there.